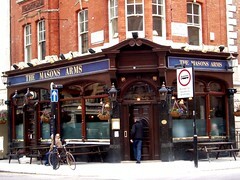 Decent pub not too far from Great Portland Street Station, on Fitzrovia/Marylebone borders. This carpeted pub has something of the feel of a locals' establishment, if a little cleaner and upmarket given its location. There's an open area with leather banquettes and four-person tables, as well as standing room around the bar (which quickly fills on a busy evening). Upstairs is a function room which can be booked, holding about 40-50 people. The toilets have Dyson Airblades installed. The bar itself has three handpulls for ale, with Deuchars IPA (£3/pint), Courage Directors (£3) and one other on an October 2008 visit, and still serving Deuchars as well as London Pride a year later. Thai food is served, with a good sized menu. Everything is available with various meats, or vegetarian, and range from around £6-£7 for mains. Ewan's vegetable green curry was perfectly tasty, and a good size as well. The prawn crackers were particularly good value, and had a pleasant spiciness to them. Last visited by Ewan and others, 28 October 2009. Last edited 2013-05-10 07:33:50 (version 6; diff). List all versions. Page last edited 2013-05-10 07:33:50 (version 6).